By: Erik Hyrkas on January 18, 2018. There’s few things more annoying than having one load of dishes to do (in your dishwasher) on a cold day and absolutely no dish detergent. Thankfully, there’s a DIY project for that. Rather than putting on the long johns to hit your proximate convenient store, why not make your own dish soap? Fortunately, most of the basic ingredients in your dishwasher soap pods are likely in your home, so this quick fix isn’t difficult to put together. So what do you need? 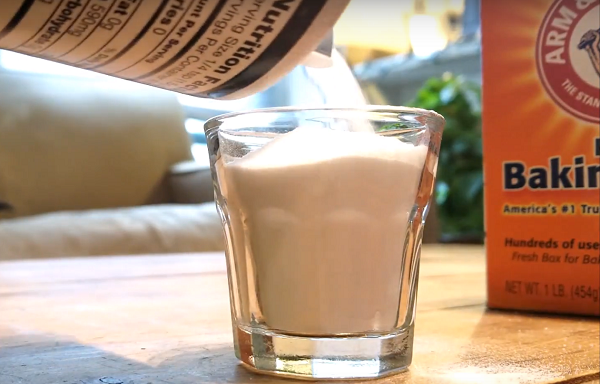 To see the full remedy in action, check out our quick video of this recipe below. While we recommend this as a quick fix, this will not leave your dishes as sparkling as your standard dishwasher detergent. For that, you might want to do an additional rinse cycle after washing, or simply buy more dishwasher detergent. Also, be sure not to use too much dish soap, or you’ll end up with a bad Lindsey Lohan movie soap bubble gag in your kitchen. Obligatory: Use at your own risk. Last updated by Erik Hyrkas at January 18, 2018 .